population. They quickly became known as Doodlebugs. extended across a radius of 400 - 600 yards . up to 20 would totally collapse. Brick walls were pulverised into small fragments. de-housed or shivered in cold, damp and roofless houses. 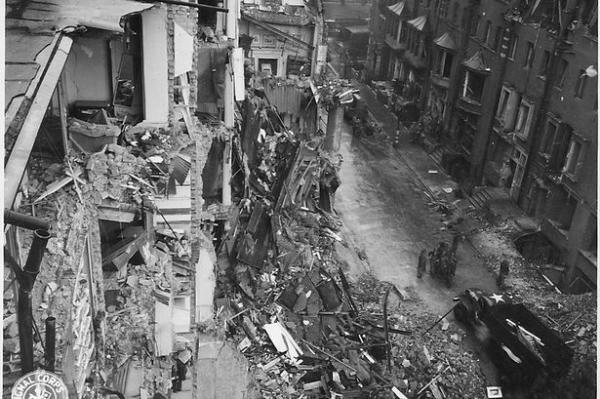 Anyone unlucky enough to be close to the impact site were blown apart or suffered crush injuries from falling masonry. of less flying glass injuries but more crush injuries from people being buried in the ruins of collapsed houses. their home and treasured possessions. food stuff which had been in short supply became easier to get again. about Hitler's secret weapons but these were taken as a joke by civilians. Northern France. This delayed the launch of the first missile by about 6 months but at the cost of the lives of 2000 allied airmen. 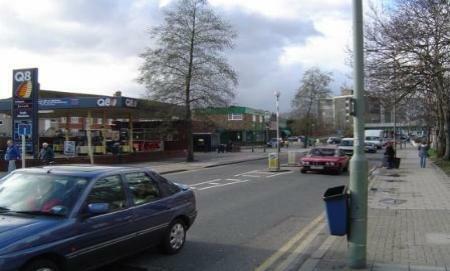 but throughout the campaign South and South East London took the brunt. 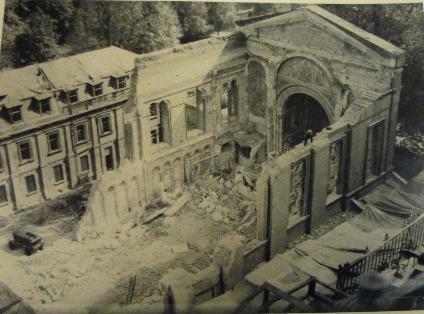 If the Luftwaffe could have chosen a target,none would have been better than the Guards Chapel. 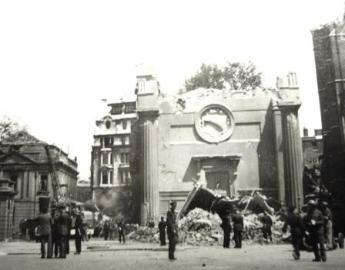 It stood in Bird Cage Walk, St James and was the home of the Royal Guardsmen based at the Wellington Barracks. roof collapsed on the congregation. Rubble was piled up to 10 foot deep. altar from which he was conducting the service was covered by a portico which sheltered him from the blast. number was concealed as many would have been government officials or service personnel. downstairs and opened the door of an empty room. At that moment he heard a V1 cut out overhead and he dived under the cover of a desk. and he was taken to a first aid station himself. 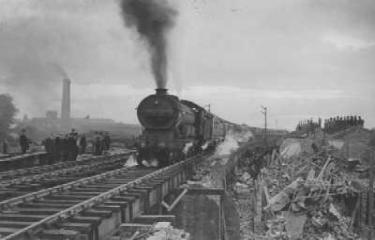 Apart from the human toll the whole of the Eastern side station offices were badly damaged. 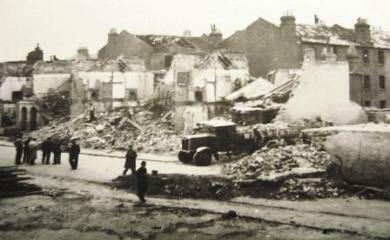 There was also lesser damage to the Grosvenor Hotel and to shops in the Wilton road area. 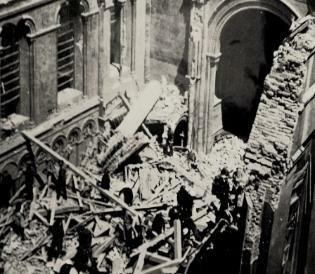 The entire eastern sized arched roof at Victoria did not have any glass left in it at all. was not recorded why-perhaps they had been attending a previous bomb). 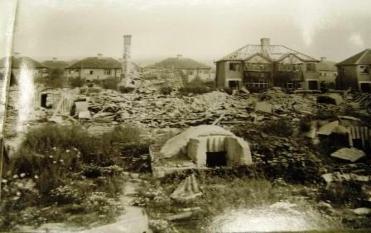 as the restaurant huge destruction was caused to the shops and houses that used to line the road at this point. were packing the V1's with more powerful explosives. 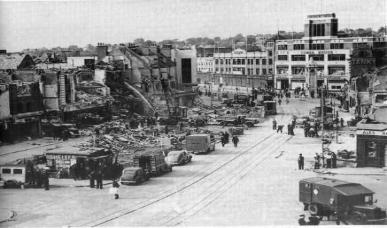 with 16 others when a V1 hit Elmers End bus garage on the 18th July. 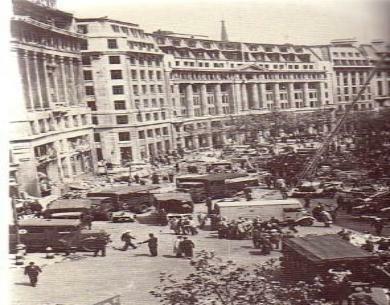 The V1 exploded on the roof of a shelter outside Marks and Spencer's. 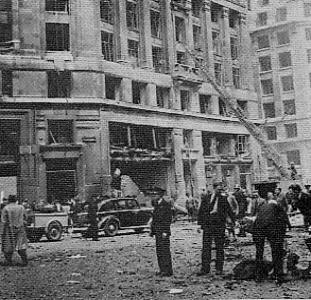 59 people died in this tragedy and a further 124 were very seriously injured. Hundreds of others suffered less serious injury.